You are at:Home»Technology»How Does Monitor Eye Care Technology Work? It is a proven medical fact that staring at the monitor screen for prolonged hours can put strain on your eyes. As a result, you can develop symptoms like eye fatigue, irritation, dry eyes as well as blurry vision. The good news is that monitors have come a long way in terms of the features that they offer. Monitors offer us a range of features including the significant ones like color precision as well as the more trivial ones like the speakers. However, the question is, what about the damage looking at monitor does to your eyes? Has there been any leaps in improving that aspect? The short answer is yes! Let us read about this a bit more. The way monitors typically adjust their brightness is by flickering the back light on and off. Depending on the brightness that you set, the amount of flickering differs. So if you have a monitor at full brightness, the flickering will be low. On the other hand, if you have a monitor with mid-level brightness, the screen will flicker a lot more. This is due to the Pulse Width Modulation (PWM) technology. This screen flickering is not visible to naked eye. However, since it is always there in the background, it is constantly tiring your eyes over a long time. Fortunately, the newer monitors have essentially removed this nuisance. 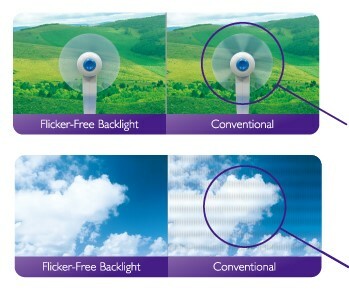 They have adopted flicker free technology thus helping in reducing your eye fatigue. If you know your science and especially the light spectrum, you will know that different coloured lights carry different levels of energy. You will also know that blue light carries the most energy. Did you know that this light can also damage your eyes? Since conventional monitors do not discriminate between the colors of the lights, you basically get a constant high dose of blue light for as long as you stare at the screen. The Low Blue Light filter on monitors are essential to help solve this issue. This filter essentially removes all the harmful blue light wavelengths from the display. Refresh rate is the measure of how fast the screen updates the content on it. The higher the refresh rate, the faster it updates. The faster the screen updates, the smoother the motion becomes. However, it is not just about the moving visuals that the refresh rate improves. This all has to do with the aspects that the visible eye cannot see. A 60 Hz refresh rate monitor updates the content 60 times in a second. On the other hand, a 144Hz monitor would refresh 144 times in a second. The higher the refresh rate, the less fatigued your eyes tend to get. Humans are not used to seeing only 60 frame rate in real life. They see a lot more. Therefore, a monitor that only refreshes 60 times is something new which the eyes have to constantly make sense of. This is tiring for both eyes and the brain. A few monitors, especially a select few by BenQ, have the ambient light sensors. These sensors adjust the brightness and contrast ratio of the monitor depending on the ambient light around you. We all know that working with a bright screen in a dark room is highly damaging to the eyes. This sensor essentially fixes that for you. While all these technologies that we mentioned help in reducing eye fatigue, there is no substitute to closing your eyes or getting away from the computer screen from time to time. If you care much about the health of your eyes, then avoid continually looking at the screen.